A precise and clear map carried out with advanced techniques and the collaboration of the geographical Service of the army. It prints with clearness and precision all the footpaths, for which there is also a short description at the back of the map. All the road network, all the villages and the cities. The picturesque ways are marked in green. Precise mileage from crossroads to crossroads and at some critical crossings is marked the spot (geographical coordinates) to know exactly where you are if you travel with a GPS system. 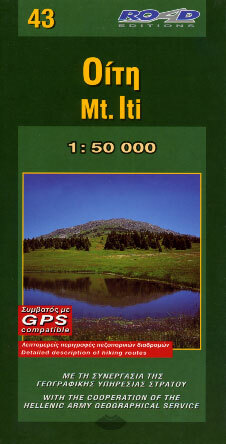 Oiti / Iti is a beautiful and "easy" mountain, ideal for familial excursions and easy walks, and this map is what you need for a such campaign. Of course exist also the difficult and more tedious paths for experienced alpinists, as a likeable mountaineering shelter, built in ideal point so you can use it as base of your explorations.